Chrome is a fantastic browser, but is is still the best among new competitors? Picking a web browser isn’t like selecting an operating system or smartphone ecosystem. Unlike choosing MacOS, Windows, or Chrome OS, where your choices are mutually exclusive, switching between browsers isn’t quite so jarring. You could download any one of the major browsers on the market today in the time it takes you to finish reading this paragraph. But how do you know which is the best browser for you? To help you decide, we’ve broken down the best browsers on the market today and boiled them down to their bare bones. Even if some of them could do with being rebuilt from the ground up, these options are your best chance at a great online experience. Chrome is ubiquitous — and for good reason. With a robust feature set, full Google Account integration, a thriving extension ecosystem, and a reliable suite of mobile apps, it’s easy to see why Chrome is the gold standard for web browsers. Chrome even blocks some ads that don’t conform to accepted industry standards. Chrome also boasts some of the best mobile integration available. With a mobile app available on every major platform, it’s easy to keep your data in sync, making browsing between multiple devices a breeze. Sign into your Google account on one device, and all your Chrome bookmarks, saved data, and preferences come right along. Even which extensions are active stays in sync across devices. It’s a standard feature you can find on other platforms, but Chrome’s integration is second to none. Google recently released Chrome 69, celebrating the browser’s 10th birthday with a significant visual redesign and some nice new features. The user interface was rounded and smoothed out, losing all of its previous sharper edges and harsh angles for a gentler and more attractive aesthetic. Tabs are easier to identify thanks to more visible favicons, making it perfect for anyone who typically keeps open a large number of tabs. Note that as of Chrome 71, you can no longer go back to the old interface. In addition, Chrome’s password manager now automatically generates and recommends strong passwords when a user creates a new account on a web page. The search bar, or Omnibox, now provides “rich results” comprised of useful answers to questions when they’re typed in, calculator results, sporting event scores, and more. Finally, favorites are now more accessible, and they’re now manageable on the New Tab page. What’s the bottom line? Chrome is fast, free, light, and even better-looking. With a thriving extension ecosystem, it’s as fully featured or as pared down as you want it to be. Everything is right where it should be, privacy and security controls are laid out in plain English, and the browser just gets out of your way. That’s even more true as of Chrome 70, which doesn’t automatically log you in and which now sports picture-in-picture mode for videos on the desktop. If you’re not sure which browser you should be using, you should be using Chrome. Firefox comes in a close second — a very close second. 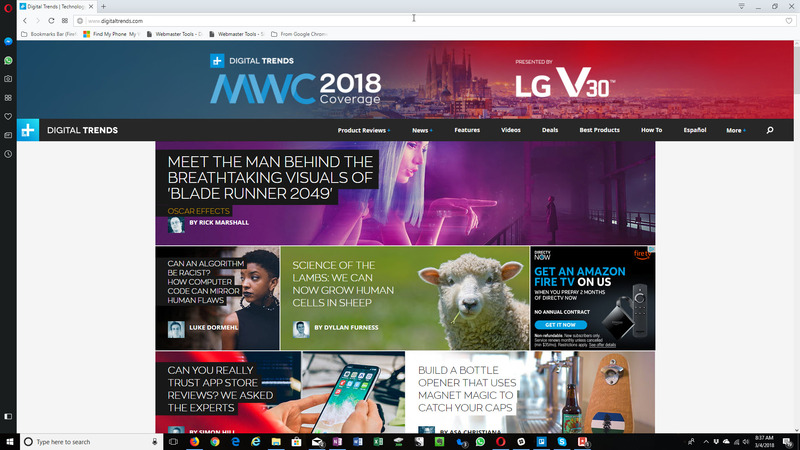 Mozilla has been taking real strides in making its browser a truly modern way to surf from site to site, thanks to efforts like its recent upgrade to Firefox Quantum and the VR-focused alternative, Firefox Reality. The latest version of Mozilla’s familiar old standby rebuilds the browser’s UI from the ground up, offering a cleaner, more modern take on what a web browser should be, and even introducing a password-free browsing experience. The changes aren’t just skin deep, though. There’s some impressive engineering going on behind the scenes. Firefox Quantum is designed to leverage multicore processors in ways that its competitors just aren’t doing. It’s not going to make a huge difference in your day-to-day browsing, but the Mozilla Corporation hopes it’s going to give it an edge moving forward. By engineering for the future now, Firefox Quantum is in a better position to take advantage of quicker and quicker processors as they come out year after year. Beneath those changes, it’s still the same Firefox we all know and love. It’s a capable browser, with a deep catalog of extensions and user interface customization. The new Firefox Mobile app also received the Quantum treatment, so it’s quicker and more streamlined than ever before. Grab the mobile Firefox app and you’ll be able to share bookmarks between devices, but you’ll have to sign up for a separate Firefox account. Unfortunately, managing settings across platforms isn’t as seamless as it is in Chrome. Even with the recent overhaul, Firefox is a comfortable, familiar standby. There’s a bit of a fringe benefit, too. Because it’s been around longer than Chrome, some older web apps — the likes of which you might encounter at your university or workplace — work better on Firefox than they do on Chrome. For that reason, it never hurts to keep it around. As a primary browser, Firefox doesn’t offer much that Chrome doesn’t, but its latest update is making it a very compelling alternative if you’re in the mood for something a little different. Also a venerable browser and popular alternative, Opera shares much of Chrome’s DNA. Both browsers are built on Google’s Chromium engine, and as a result, they have a very similar user experience. Both feature a hybrid URL/search bar, and both are relatively light and fast. The differences appear when you start to look at Opera’s built-in features. Where Chrome relies on an extension ecosystem to provide functionality users might want, Opera has a few more features baked right into the browser itself. It also recently introduced a predictive website preload ability, and a new Instant Search feature isolates search results in their own window while the current page fades into the background — letting users more easily focus on the research task at hand. 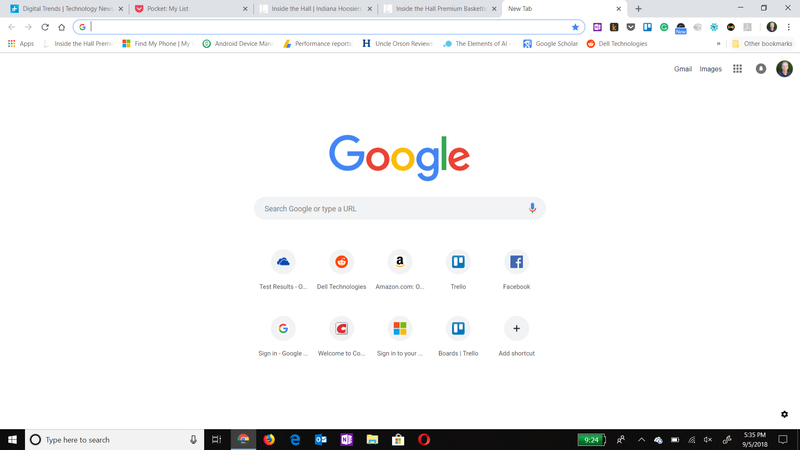 As of Opera 55, you can also install the Chrome extension from the Chrome web store, meaning that not only can you run the same extensions as if you were using Chrome, but discovering and installing extensions is just as easy as on Google’s popular browser. If Chrome’s wide variety of extensions are important to you, then Opera becomes an intriguing alternative. With Opera 56, the browser was furthered refined, meaning that Opera might just be one of the best browsers for quickly navigating web pages. Opera also features a built-in “Stash” for saving pages to read later. There’s no need to sign up for a Pocket or Evernote account to save a page for later reading. Similarly, Opera features a speed-dial menu that puts all your most frequently visited pages in one place. Chrome also does this but only on a blank new tab. Finally, Opera has a built-in unlimited VPN service, making it a more secure option. You can see that we’re well into hair-splitting territory, which is why it’s important to remember that your choice of browser is, more than any other service or app you use on a daily basis, entirely dependent on your personal preferences — what feels most right for you. Opera has a unique look and feel, and it combines some of the best features of Firefox and Chrome. 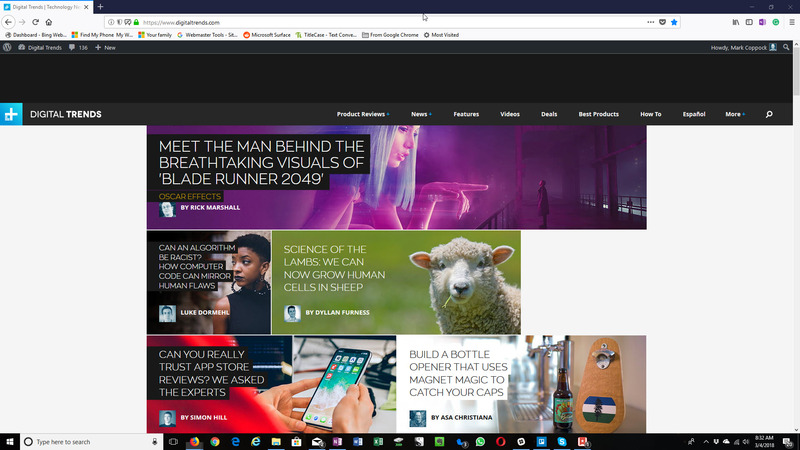 Edge resembles Internet Explorer 11, though with even smaller borders, fewer icons, and a streamlined toolbar designed to mirror Microsoft’s new Windows 10 UI aesthetic. A solitary address-search bar also runs the width of the page, along with a trio of headline features that include excellent PDF capabilities, ebook reader support with Windows Store tie-ins, Windows Ink support, reading view, and Cortana integration. It’s ultimately the next generation of Internet Explorer, in that it’s the default Windows web browser. With Edge, Microsoft continues to roll out new platform-specific features, like support for its A.I.-assistant Cortana. 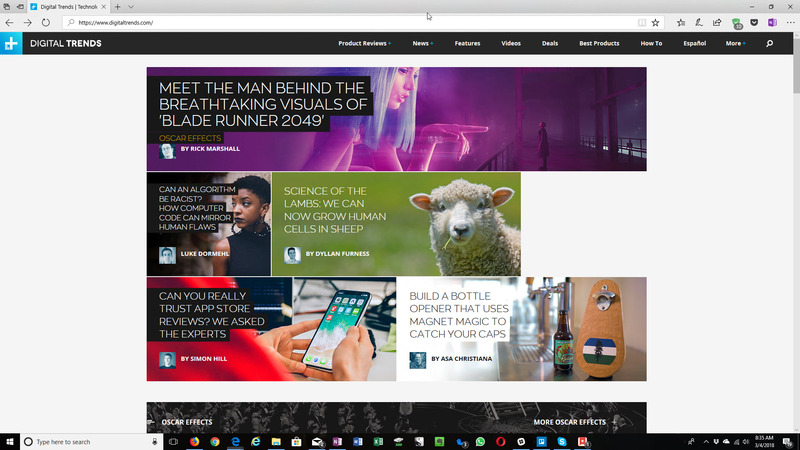 Rather than just leaving it to languish and tossing out an occasional security patch, Edge receives a lot of TLC from Microsoft, especially when it comes to efficiency. Microsoft often claims it’s the best browser for maintaining laptop battery life. On the downside, Edge has relatively slim extension support, and it doesn’t allow for much customization. While quick, its pared-down interface can feel a little too bare-bones at times. Note that Microsoft has increasingly robust iOS and Android versions, and so keeping your bookmarks and passwords in sync while you’re on the go is finally a possibility with Edge. If you’re looking for something a bit more experimental than Chrome or Firefox, just fire up Edge and see what it can do. You might be surprised. And with each major Windows 10 update, such as the Windows October 2018 update, Edge gains new features that are worth a look. But get your fix in now, because Microsoft is switching Edge over from its own EdgeHTML engine to Google’s open-source Chromium Project. While the preceding browsers will meet most users’ needs, other alternatives exist for anyone who’s looking for something different. If you run Apple platforms exclusively, then you might want to consider Safari if it’s not already your default choice. Safari might not be the fastest Mac browser around, with Chrome being significantly quicker, but it’s fast enough that you won’t feel too slowed down. And it’s the most integrated into MacOS, meaning you’re going to feel more at home and you’ll likely get better battery life thanks to some Mac-specific optimizations. Safari also focuses a great deal on privacy and security. If you want to minimize how you’re being tracked and whetherBig Brother is looking over your shoulder, then Safari is a good choice. If you also use an iPhone and/or an iPad, then using Safari on your Mac will make for the most seamless transition between platforms. Vivaldi is truly unique. No two Vivaldi users will have the same setup. When you run it for the first time, you’re guided through a setup process that lays out your browser in a way that makes sense for you. You get to choose where your tabs and address bar go, and you get to choose if you want browser tabs displayed at the top of the page or in a separate side panel. This is a browser built from the ground up to deliver a unique user experience, and for the most part, it succeeds. Vivaldi 2.0 enhanced the customization features and made them easier to access. We certainly enjoyed Vivaldi when we gave it a go. This browser excels at customization, and you can choose from a variety of tasteful themes that don’t feel dated or out of place on a modern PC, in addition to the aforementioned UI choices. It also has some stand-out privacy-enhancing features, like a recent team-up with DuckDuckGo, to make the non-tracking search tool the default option when in privacy mode. Finally, the latest version added more powerful tab management, enhancements like Web Panels that make for smarter browsing, and (as mentioned) even more powerful customization options. One of the most unusual browsers around is Brave — or, perhaps, its Brave’s business model that’s the strangest. Brave blocks all ads on all web pages by default, which makes it arguably the fastest browser around. Ads are a huge portion of how many web sites make money. Block ads and suddenly the most important web financial tool is eliminated. That’s where the Brave Rewards program will come in. Users will receive “Basic Attention Tokens,” or BATs, when they view alternative ads that Brave places in the browsing stream. The users can pass along a portion of their tokens to publishers. In the future, Brave hopes that publishers will jump on board and offer premium content in exchange for BATs. What’s in it for users? Simply put, if you’re not waiting for ads to download along with web site content, then your web experience is going to seem much faster. And, Brave performs no user tracking, making it a private browser as well. The Tor Browser is a version of Firefox that serves one very specific purpose. It provides a simple entry point for Tor (The Onion Router), which is software combined with an open network aimed at making you invisible by routing your traffic through a number of anonymous servers. While it’s not absolutely foolproof, it’s very difficult for someone to identify you when you’re properly configured and using something like the Tor Browser to surf the web. Especially if combined with a VPN. There are a number of legitimate uses of the Tor Browser and the Tor network, such as people who live in countries with repressive governments, as well as journalists and activists. The dark web is also one of the destinations for people using Tor, and that includes a number of nefarious and illegal sites. In any event, if you want to remain completely anonymous while you’re on the web, then the Tor Browser and network are for you.